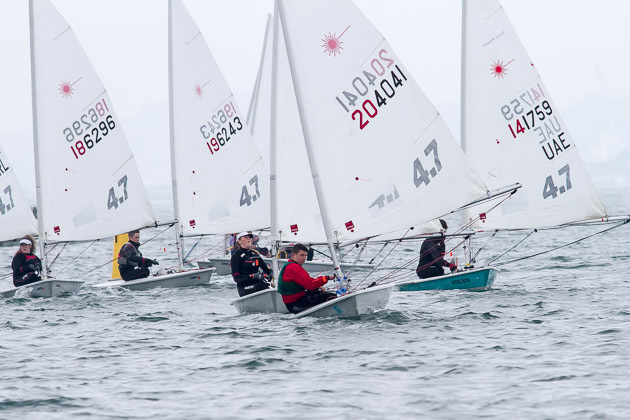 Galway Bay Sailing Club which is situated close to Oranmore village, Co. Galway was the venue for the 2015 Laser Connaught Championships. The numbers competing across all three laser classes/rigs ( standard ,Radial and 4.7) were strong with a very high standard set by a portion of these sailors aspiring to represent Ireland in the 2016 Olympics. The Royal Cork once again provided the largest number of sailors with 20 travelling west. Racing kicked off on Saturday around midday with overcast conditions but relatively warm and pleasant with a 12/20 knot breeze. Three races were completed. Sunday was a different story. The competitors woke up to a much stronger breeze with big seas. These conditions resulted in the race officer cancelling the 4.7 fleet for the rest of the day. The Standard and Radial fleets were launched and even then a number of sailors decided to not race for risk of gear failure etc. Seafra Guilfoyle (fresh from completing his Leaving Cert exams) had a great event in the Standard rig with a 3rd overall. Thomas Chaix won the Masters category with Nick Walsh right on his tail throughout the event. The rest of our ‘mature’ Standard rig Laser sailors (E. Rice, B. Duane Snr and P. Coveney) competed very well. The younger Cian Byrne (and LC finisher) had to deal with gear failure. The even younger Richard Thompson and Tom McGrath rounded off this class with very respectable performances . The Radial fleet was dominated by the Olympian Annalise Murphy. Wow what a sailor in those conditions. But our own Ronan Walsh, Charlie Maloney, Jamie Tingle, Billy Duane Jnr, Tara Coveney and Criofan Guilfoyle highlighted that they can play with the best of them as they mature into this very competitive Laser Radial class. Finally the 4.7 title was decided on a three race series with Richard McGinley, Rebecca O Shaughnessy, Luke McGrath, Eoghan O Regan and Patrick Daly all finishing well up the leader board in the thirty one strong fleet.